There are a number of sub-species of the Steller's Jay. In North America, north of the Rio Grande River, there are mainly two races. 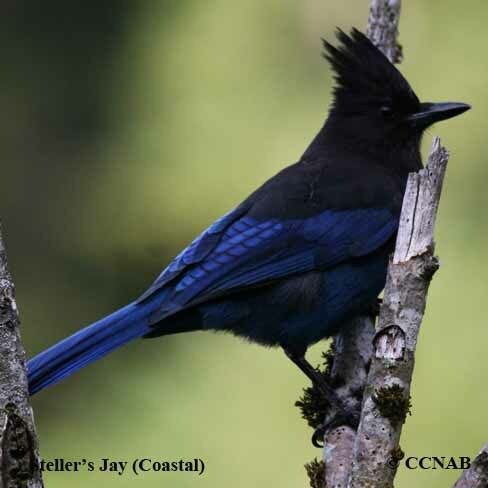 One is the Steller's Jay (Coastal), found along the Pacific coast, usually west of the Rocky Mountain, from southern Alaska, southward to the southern boundaries of California. The Steller's Jay (Interior) is seen on the east side of the Rocky Mountains from British Columbia southward into New Mexico. There are more races in Mexico and Central America. The Steller's Jay is a very attractive bird. It is a member of the "corvidae" family, the same group as the crows and ravens. It is a bold and noisy bird, which can be seen around backyard bird feeders.